Butler University’s College of Education and College of Liberal Arts and Sciences present a free public screening of the documentary “Mentor,” about two high school students who were bullied so severely that they died by suicide, January 27 at 7:30 p.m. in the Howard L. Schrott Center for the Arts. The film, written and directed by Butler Visiting Professor Alix Lambert, focuses on the families of Sladjana Vidovic and Eric Mohat, who sued Mentor (Ohio) High School administrators for ignoring the bullying that led to the death of their children. 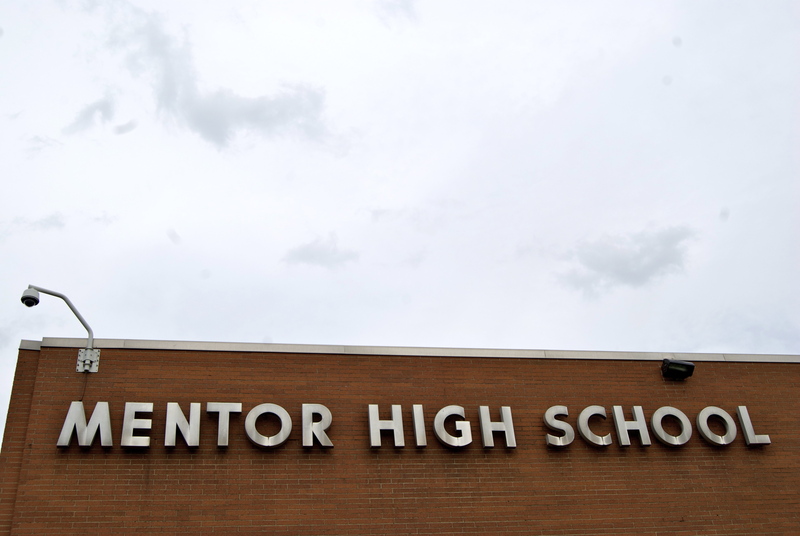 In all, five Mentor students killed themselves from 2005 to 2010. “ ‘Mentor’ is both heartbreaking and soberly resolute in its inquiry into the institutional forces and ‘culture of conformity’ that fail young members of our communities,” Filmmaker Magazine wrote. “This film provides a platform to engage in critical dialogue surrounding the devastating impacts bullying can have on a community,” she said. “As educators, we need to continuously work to build school cultures that are teaching kids the pro-social behaviors that result in the development of kind, accepting, and productive citizens in our communities." Lambert’s previous documentaries include “Mark of Cain,” a documentary about Russian prisoners that was nominated for an Independent Spirit Award and aired on Nightline, and “Bayou Blue,” a look at the families of the victims of a Louisiana serial killer. She also has worked on the HBO series Deadwood and John From Cincinnati as a writer and producer. 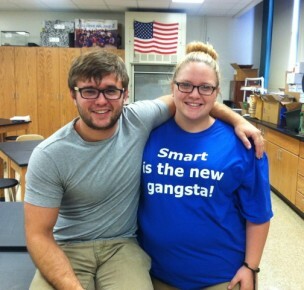 Lambert said she made “Mentor” as a way to put the issue of bullying in context. Abdul-Rahman (Peter) Kassig had traveled to Lebanon in 2012 to provide medical and humanitarian assistance to those in need. He founded Special Emergency Response and Assistance, an aid organization for Syrian refugees. He approached life selflessly and courageously, and he upheld the Butler ideal of trying to make the world a better place. 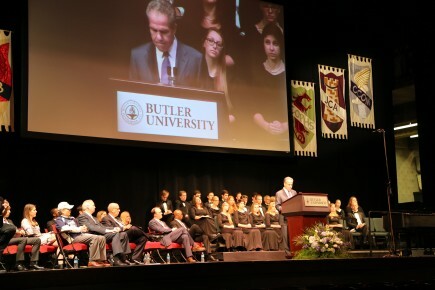 The Butler community joins millions around the world in prayer and support for the Kassig family and for Abdul-Rahman's cause in the Middle East. As students trickle into room 238 at Shortridge Magnet High School, stagnant silence grows to a dull roar of laughter and chatter. Butler University students and Shortridge students catch up over peanut butter and jelly sandwiches, then get to the task at hand: creative writing. Today, they will be crafting their own parodies. 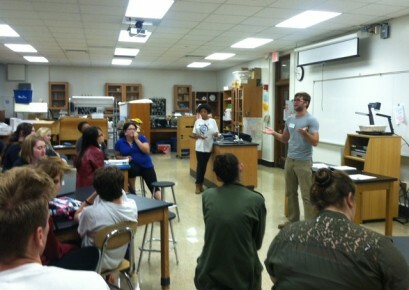 Butler MFA graduate student Luke Wortley leads the weekly poetry slam as part of the Writing in the Schools program. One student writes and performs a parody of Miley Cyrus’s “Wrecking Ball,” reflecting upon the human contribution to global warming and the destruction of our planet. Another student exercises her imagination to rewrite One Direction’s “You and I” from the viewpoint of a love-struck fan. It took less than 15 minutes for the cluttered science classroom to transform into a collaborative, energetic writer’s studio. The students spent the afternoon writing and laughing and writing some more. No idea is rejected ­– all are important and supported. 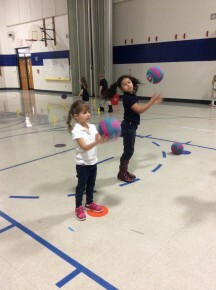 Their activity is part of Writing in the Schools, a product of the Butler University and Indianapolis Public Schools partnership. The program meets twice a week at Shortridge, with Butler students enrolled in EN455-S Writing in the Schools offering student-to-student mentorship to Shortridge youth. The writing prompts vary each week, and all students are encouraged to perform their work in front of the class at the end of the session. 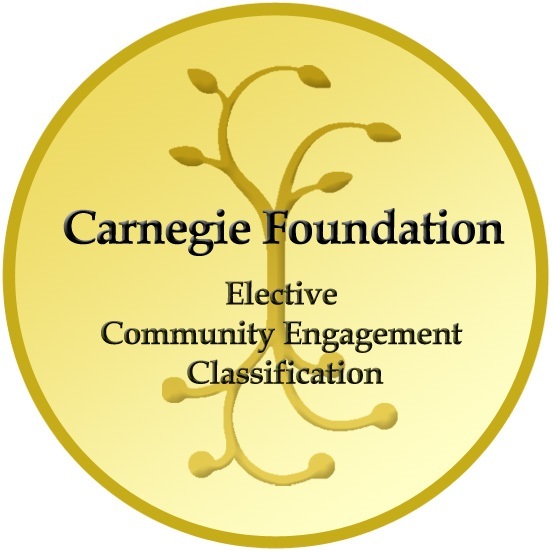 The program was initiated in 2011 under the guidance of Susan Sutherlin, Butler English Department Director of Peer Tutoring, to provide students the opportunity to work in the community with liberal arts and encourage written creativity among local youth. Sutherlin taught and developed the program during its first two years before passing on the baton to Butler faculty member Chris Speckman, who served as her graduate assistant while still in Butler’s Masters of Fine Arts Creative Writing program. Speckman, EN455-S professor and Writing in the Schools director, is entering his second year as the leader of the program. He hopes to build a community of writers where people from different walks and stages of life can connect through creativity and shared experiences. Room 238 is a nonjudgmental space where all students are encouraged to find their voice. 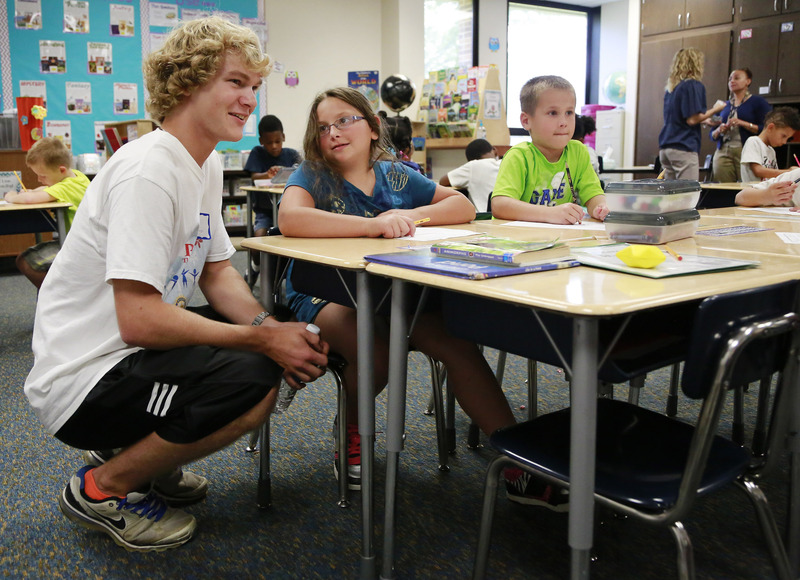 MFA graduate student Luke Wortley, in his second year as a graduate assistant, has found particular meaning in the Writing in the Schools program. He chose to attend Butler because of the one-of-a-kind opportunity to mentor high school students through creative writing. Wortley said he never gets tired of watching the Shortridge students break down their barriers as they cultivate relationships with Butler students and learn to understand their written voice. With a newfound passion for public education, Wortley said he now hopes to become a high school teacher and remain involved in after-school programs for youth. He credits this decision to his experience with Writing in the Schools. Piano melodies of Chopin, Mozart, and Gershwin drift through the air as Patricia Smith walks into the St. Vincent Heart Center lounge to wait for her husband during his surgery. 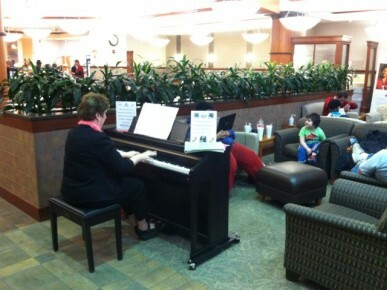 She enters the atrium, makes a beeline past the blaring television and concerned families, and takes a seat to listen as Butler University Adjunct Piano Professor Anna Briscoe performs. Anna Briscoe said her performances at the St. Vincent Heart Center helped soothe anxious families. Briscoe plays at the Heart Center as a part of a new partnership between the hospital and the Jordan College of Arts School of Music. Faculty and student musicians will play informal lunchtime concerts at the Heart Center each week to share the power of music for healing and relaxation. Susan Jacques, hospital chaplain, said the Heart Center agreed to host the concerts to support the spiritual health of families and loved ones waiting nervously in the lounge. Briscoe said she enjoyed her first time playing piano at the Heart Center. She has played at retirement centers before, but she said she thinks her music has a different kind of impact here—it helps people relax and remember to just breathe. Larry Shapiro, Professor of Violin, said the idea for this partnership developed after Chuck Goehring, his longtime friend from St. Luke’s United Methodist Church, proposed that the School of Music send student and faculty musicians to the hospital to heal through music. Goehring underwent open-heart surgery at the Heart Center about six years ago, and Shapiro said his friend was bent on giving back to the hospital after his incredible care. 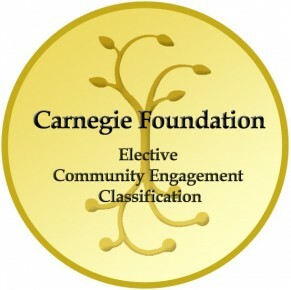 Shapiro presented the idea to Lisa Brooks, Chair of the School of Music, and Ronald Caltabiano, Dean of the Jordan College of the Arts, several weeks ago, and they supported the idea. The partnership is new to Butler this fall semester, but the School of Music aims to provide the hospital with a student, a faculty member, or a small chamber ensemble to play music on a weekly basis. Ben Abel ’16, concertmaster of the Butler Symphony Orchestra, will play violin at the Heart Center sometime this week. Others scheduled to perform this month are guitar student Patrick Wright and former violin student Tricia Frasure. Briscoe said she is already looking forward to a full season of festive music at the Heart Center. On September 22, 1974, Sharon Leininger ’70 and Michael Nemeroff got married in Holcomb Gardens. Forty years later, they returned—this time to plant a Japanese maple tree to commemorate their 40th anniversary. The Nemeroffs first met in Indianapolis in 1972 when he was in the Army and she was working in politics. “She didn’t like someone like me at the time,” Mike said. About a year later, they met again, this time in Washington, D.C. “She liked me better then,” he said. They got married a year later, with Doug Petersen, Nemeroff’s college roommate and a Presbyterian minister, performing the ceremony. On Monday, Petersen was back, along with his wife, Anne, to help the Nemeroffs celebrate. The tree planting idea was in the works for a year and a half. Mike Nemeroff contacted Graham Honaker, Senior Development Officer, who made the arrangements, which included a sparkling wine toast and flowers. “It’s a nice way to celebrate 40 years,” Honaker said. 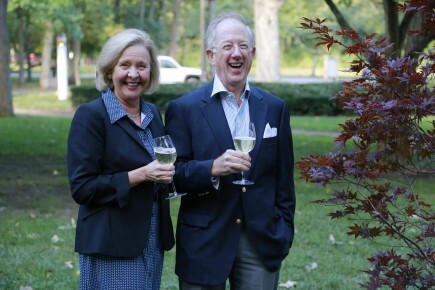 The Nemeroffs, who made a gift to Butler in honor of their anniversary, agreed. 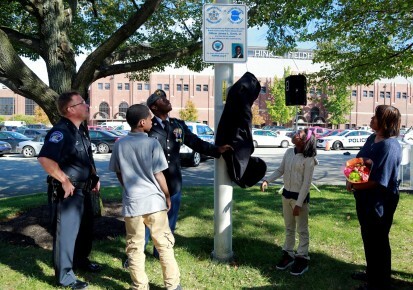 “If there is anything we can do to show our continued thanks for James, it is to make sure we never forget him,” Assistant Police Chief Andrew Ryan told an audience of about 75 that included Davis’s widow, Veleda; their children Josiah, Jarren, and Jaedyn; Veleda Davis's parents; police officers; administrators; and others outside Hinkle Fieldhouse, where Davis was killed. To remember Davis, a sign was unveiled in his honor as part of the Fallen Officers Legacy Project, which memorializes officers killed in the line of duty. In addition, the Holcomb Carillon bells chimed 10 times in recognition of the 10th anniversary. Butler President James M. Danko said the community owes Davis a great debt for his bravery and sacrifice. Josiah Davis, who was 8 at the time of his father’s death and is now a high school senior, said his father was an “optimistic, caring, and strong person,” who loved being a police officer. 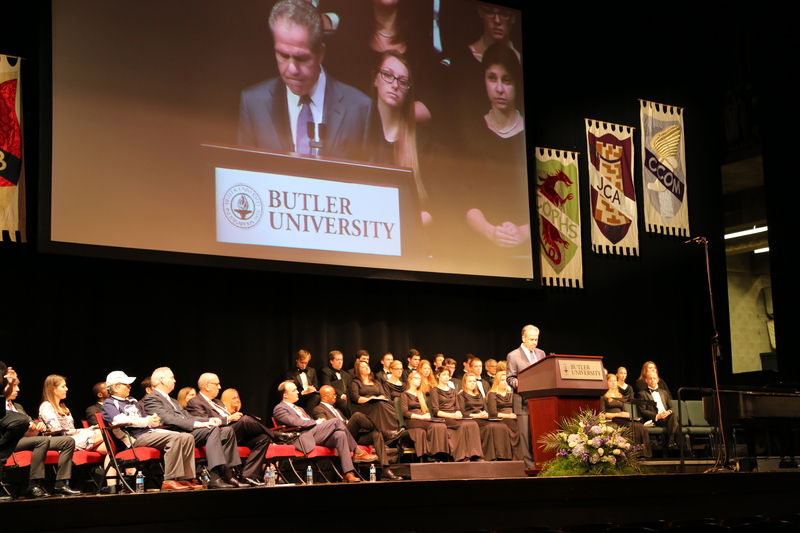 Josiah thanked the Butler community for being there for him and his family. The temperature hovered around 90 degrees as freshmen Sidney Parrish and Julia Thomas pruned trees at Indianapolis’ Holliday Park. Parrish and Thomas volunteered at the park as a part of Bulldogs Into the Streets (BITS), an annual freshman orientation public-service program organized by Butler University’s Volunteer Center. Gardening and cleaning up Holliday Park on a humid, summer day made for exhausting work, but the two said they loved the opportunity to venture out of the Butler bubble and make a difference in the surrounding Indianapolis community. Holliday Park Volunteer Coordinator Katie Neill said the 15 Butler volunteers transformed the park’s playground area by pulling weeds, raking mulch, trimming trees, and sweeping sidewalks. With a full-time park staff of four, Neill said she is grateful for the students’ hard work. Sam Thomas, Volunteer Center Events Coordinator and sophomore Political Science and Economics major, spent most of last semester and this summer being called “the BITS guy” as he worked with places like Holliday Park to coordinate volunteer projects for BITS participants. About 545 volunteers donated their time to 19 agencies across the greater Indianapolis area this year, but Thomas said BITS is about more than just service work. Freshmen Moriah Riggs and Nicolina Cecere said they, too, appreciated their BITS experience at Joy’s House Adult Day Service in Broad Ripple as new Butler Bulldogs looking to get acclimated in Indianapolis. Riggs and Cecere spent time playing bingo and conversing with visitors to Joy’s House, an adult day service for community adults with physical and mental disabilities who are no longer able to stay at home safely. Candace Preston, Joy’s House caregiver and Program Manager, said the house guests love the opportunity to meet and interact with the Butler students. Thomas said the goal of BITS is to recruit freshman volunteers and encourage them to take advantage of future service opportunities in Indianapolis. According to Thomas, the Volunteer Center will host a Volunteer Opportunities Fair on September 5 to provide an experience where students can discover new community volunteer options. The fair will include many of the agencies that hosted students during BITS this year. The good work being done by the Butler University College of Education (COE) has earned national and local attention. Author Marla Olthof, who spent time at IPS/Butler Laboratory School in 2012 to learn about its outdoor education efforts, has featured the school in her new book, Gardening with Young Children: Second Edition of Hollyhocks and Honeybees. The Lab School is featured in a two-page spread on pages 106-107, and numerous photographs of Lab School students are displayed throughout the book. The Lab School’s “edible schoolyard” project was funded in part through a $12,000 Dow Promise Grant to Butler. COE students developed the grant proposal and the initial Lab School gardens last spring as part of a “Leadership in Education” course. The COE collaborates with Indianapolis Public Schools in the Lab School's curriculum development and operations. 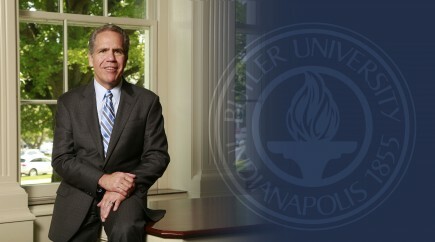 All faculty hold Butler education degrees. Also, an early childhood documentary called Little Children, Big Returns, featuring interviews with Dean Ena Shelley and Ted Maple ’01, will air May 8 at 9:00 p.m. on WFYI-1 (Channel 20). Maple is president and CEO of Day Nursery, which operates seven Indianapolis-area child care centers that provide care daily to more than 750 children ages infant to 6 years old. The documentary delves into the positive business and financial impact properly funded pre-kindergarten programs have on the state. Preview it here: http://youtu.be/sh5SzlOxRm0.